Once more to the Primetime Emmy Awards my friend, once more! And once more, as seems to be the case every year, there is controversy aplenty but not this time, oddly enough, about the content of the show itself , but rather the style of the annual awards ceremony, which was described as possessing “an overall air of boring boring boringness” (Willa Paskin, Slate), and fronted by a host, the amiable and funny Seth Meyers, who was given the backhanded compliment of being “adequate” (Josh Dickey, Mashable). And yes, it was as safe and predictable, from the jokes told – incisive but not too cutting or controversial – to the winners – to no one’s surprise Modern Family won Outstanding Comedy Series again (pushing out Orange is the New Black and Veep sadly), and Jim Parsons took out Lead Actor in a Comedy Series for the 4th year running – he is wonderful but 4 years in a row? Why not salute the superlative talents of Louie C.K. or William H. Macy? – to the speeches which were inspirational, or wryly amusing or just sweetly down to earth. But is that really a bad thing? Have we become so addicted as a society to the extreme, the sensational, the troll-attracting edgy or opinionated that simply putting on a reasonably enjoyable awards show is some kind of crime? Granted it was not exactly a thrill-a-minute spectacle, but there was plenty about the 66th Primetime Emmy Awards that was ridiculously enjoyable, moving, hilarious and downright inspired, and yes even a little controversial. 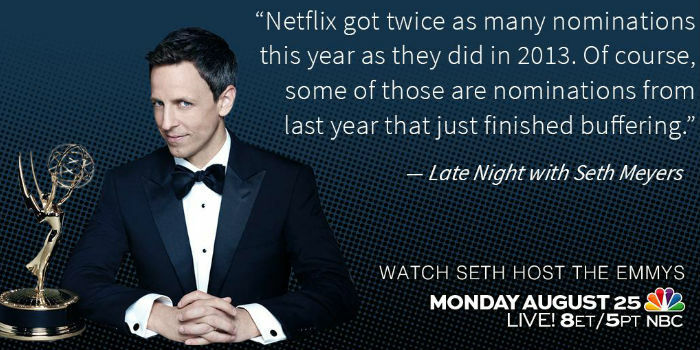 It wasn’t just Seth Meyers, who helped the Emmys to their second highest ratings in eight years, that shone. Yes his opening monologue was wryly amusing, poking fun at the VMAs and an NFL exhibition match pushing the telecast off Sunday night for the first time since 1976 – “This year we’re doing it on a Monday in August which I understand in television means the Emmys are about to get canceled” – and the slightly fluid award categories which saw all sorts of shows end up in questionable categories – “This year we had comedies that made you laugh and comedies that made you cry, because they were dramas submitted as comedies”. But Meyers didn’t let his pals hog all the comedic highlight hosting a hilarious Q & A session with stars like Melissa McCarthy (Mike and Molly) and Jon Hamm (who sadly didn’t get an Emmy again for his amazing work on Mad Men) and Andre Braugher (Brooklyn Nine Nine) asking Very Important Questions about parking and the location of the Emmys bathroom key. TV show opening themes, if they’re there at all, are quite what they used to be. Stellar though the ones that do exist in this modern day and age are – think True Blood, Nurse Jackie and Intruders to name just three – one thing they do lack are lyrics explaining exactly what the show is about. Cheesy it might have been in some ways but who could get to the end of the theme songs for The Brady Bunch or Gilligan’s Island and not know exactly what the show was about? Sensing a chance to right some creative wrongs, Seth Meyers got “Weird Al” Yankovic to pen some way overdue lyrics for shows like Game of Thrones and Homeland, and the results were a hoot, helped by perennial, adorable ham Andy Samberg dressing up as Joffrey Baratheon from the former show, and the sidesplitting side of George R. R. Martin being handed a typewriter as “Weird Al” and the singers urged him to write faster! Often rambling, many times heartfelt but very rarely truly, GIF-worthy, memorable. And Ricky Gervais jumped right inside a series of Netflix shows such as Orange is the New Black, House of Cards and Lilyhammer in a commercial that aired during the Emmys.